13 years ago - Ulthoon is spawned in the Mutogenic Mists of Deep Rann. He battles Adam Strange and is cast into deep space. 11 years ago - Ulthoon is recovered by professor T.O. Morrow, and used as basis for his new android. 10 years ago - With his android body completed, Red Tornado is send to infiltrate the Justice League, but chooses to abandon his creator and join them. 9 years ago - Red Tornado sacrifices himself to save the Justice League, his consciousness uploading itself into the League Database. 4 years ago - Red Tornado creates a new body for himself when Tim Drake, Bart Allen & Superboy discover the abandoned Mount Justice and form Young Justice. ​​3 years ago - Red Tornado sacrifices his body to protect Young Justice from a rogue Superman android. During Garner Fox's groundbreaking run on the classic Satellite Era Justice League we actually saw quite a few references back to classic heroes of DC's Golden Age. It's often not remembered that Captain Comet, while never a member of the League, spent a good while as their houseguest. A large part of what we all now understand the world of DC to be came from this one book where they created new modern versions of classic heroes. The modern sentient robot Red Tornado was a reimagining of an adorably dated Golden Age hero who happened to have a cool name. 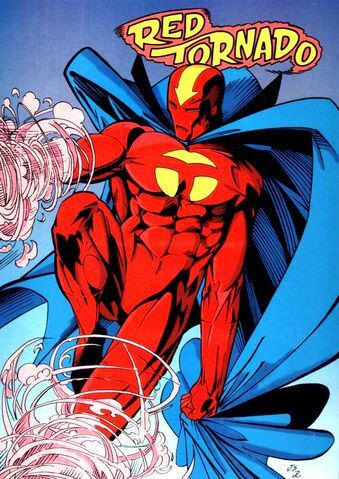 It's noteworthy that he was created in the same year that Marvel created a new updated version of Timely Comics Golden Age hero The Vision... and that both Vision and Red Tornado essentially have the same story and weirdly similar powers. Who is copying who? Well, Red Tornado debuted in August, Vision in October. Take that as you will. 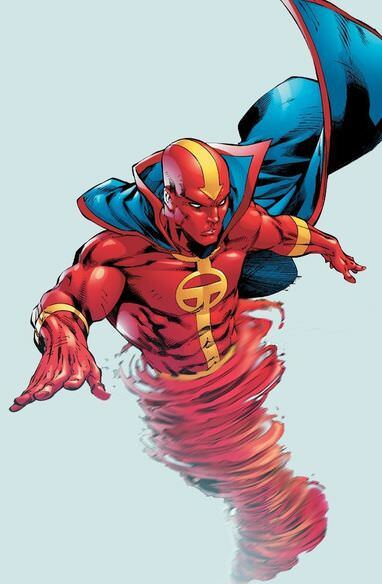 The name Red Tornado dates all the way back to 1940, a year after the debut of Batman. It was the moniker of Ma Hunkel, a overweight mother who fought local criminals with a frying pan while wearing a costume composed of long johns and a pot on her head. the Golden Age of comics were a fun time. Red Tornado as we know him was created in 1968 by Gardner Fox, giving the Justice League a sentient android with tornado powers. In his original origins, he was a combination of a android body built by T.O. Morrow and a Raanian tornado-based villain called Ulthoon the Tornado Tyrant. These origins have been altered and changed dozens of times in an effort to make the character a greater standalone success, but he was never built to be a character intended to work on his own. He was always at his best when he was just a part of the Justice League. The character has had two main resurgences; Brad Meltzer's weirdly uncomfortable 2006 run on the Justice League, and as the caretaker of Mount Justice when it was the headquarters of Young Justice during their phenominal late 90's ongoing series. Guess which story we're including. While there are a few different Red Tornado stories out there for the person that really wants to go looking for them, they tend to exist in this strange place where he, as an android, is trying to live a more human life. Given the fact that he's an artificial construct based on an alien elemental, it seems weird to use this character to tell a story that's already being told by both Robotman AND the Metal Men. Rather than try to caft some sort of weird family for this character or dwell on the nature of his body, we instead made out version more about his artificial consciousness. We had him sacrifice his original body to save the original Justice League, and allow him to become the artificial intelligence driving the Justice League's technology from there forward. We are also big fans of Red's resurgance as the keeper of Mount Justice when it is taken over by Young Justice. This is a simplified version of the character... A body he builds to assist his charges and weild his powers, despite the fact that his expanded artificial consciousness can no longer be contained within his robotic construct. 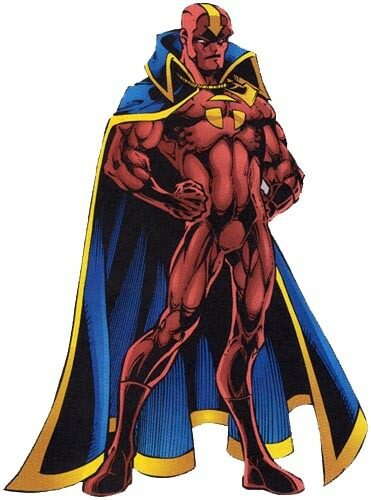 This is Red Tornado without the weird stuggles to make him relevant... This is simply a robotic hero serving the Justice League, which is what he should be. There is also one very key difference between these two looks, and I think its actually a good idea to point this out. Whenever Red Tornado is depicted with his yellow pinstriping, he has a much more human face. When he had his fully red body, he has a more robot-ish face with no nose and a slotted mouth and eyes. I actually like this distinction alot, especially if we consider the yellow pinstriped body to be his original body (the body created to infiltrate the League), and the red body to be the more disposeable body he builds himself to contain his AI consciousness. It all works quite nicely. Red Tornado's time back in a body to take care of Young Justice and Mount Justice is pretty short... only a year passes before Tim Drake and crew graduate from their small club of heroes into Teen Titans. Interestingly, It's not long after that that the Justice League Satellite is destroyed by the White Martian invasion. The fact that Red Tornado's AI is active in Mount Justice is the thing that's going to save him from being destroyed along with it. Moving forward, The Watchtower builds their moon base, and the new Justice League builds the Hall of Justice. Both teams will want access to Red Tornado's AI, and they'll have it. He will be back to being a disembodied artificial consciousness for the time being, helping drive the League's computer systems. In the future, however, there are going to be some changes. The current Teen Titans are going to battle Prometheus, and in the process the entirety of Mount Justice will be moved into his extra-dimentional space, setting up a resurgance of their Young Justice team. Sounds like Red Tornado will be taking care of his charges once again.